Egyptian President Abdul Fattah al-Sisi launched Mohammed Naguib military base in a huge ceremony in El Hammam city west of Alexandria on Saturday. Mohammed Naguib military base is the biggest in the Middle East and Africa, reported Egyptian media. 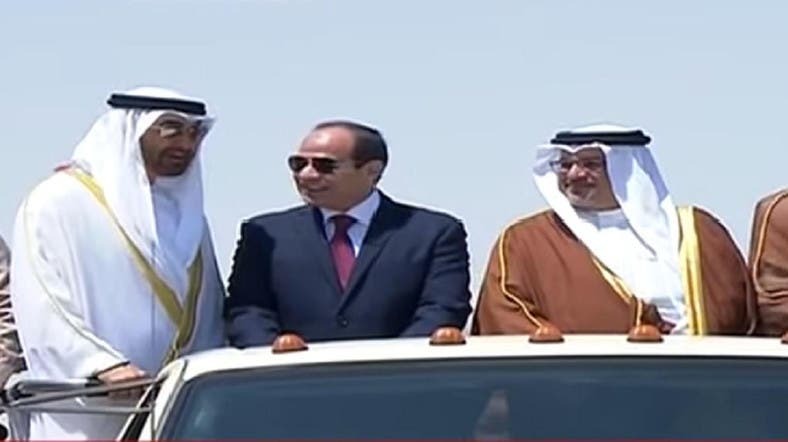 President Abdul Fattah al-Sisi underlined that the Arab participation in the inauguration ceremony of Mohammed Naguib military base is a cogent proof of Arab unity. The president welcomed Arab guests who participated in the ceremony that also celebrated the graduates of colleges and military institutes. Arab princes and ambassadors headed by Abu Dhabi Crown Prince Sheikh Mohammed bin Zayed, Crown Prince of Bahrain, Prince Salman bin Hamad Al Khalifa, Prince Khalid Al Faisal, Emir of Mecca and Sheikh Mohammad Al-Khalid Al-Hamad Al-Sabah, Kuwaiti Minister of Defense and Field Marshal Khalifa Haftar the Libyan National Army commander attended the ceremony of opening the base which is named after late president Mohamed Naguib. Sisi stressed the importance of constructive cooperation to confront the challenges besetting the Arab nation. President Abdul Fattah al-Sisi graduated new batches of the Armed Forces propped up by modern science and high-level training to be in charge of defending the nation. He said the base was named after late Egyptian president Mohammed Naguib in honor of his patriotic efforts. Sisi urged new graduates to be highly vigilant and ready for fighting in view of the watershed stage through which the region and whole world are passing. Sisi said sacrificing for the nation’s security, stability and dignity is the duty of staunch sons of the nation. He told the graduates that they are joining an ancient patriotic institution in charge of defending the nation, noting that Egyptians have always fully trusted their army. The president paid tribute to Egypt’s martyrs of the Armed Forces and police who sacrificed their souls for their country. He told the families of the martyrs that they sacrificed their sons to protect Egypt and confront terrorism and extremism, cautioning that terrorists are trying to affect the morale of the Egyptians. As for states who interfere in the Egyptian affairs, President Abdul Fattah al-Sisi said these countries will never be able to harm Egypt or regional countries, adding that no country has the right to interfere in other countries’ affairs. He highlighted that there are billions being spent to destroy countries, including Egypt. Addressing Arab military graduates, he said we send a message to the world that Arabs join hands to build not to destroy, connive or foment sedition. He said Egypt is now fighting in two battles; one for countering terrorism and the other for realizing socio-economic development. Sisi said war tactics have changed and enemies resort to panicking people and spreading desperation in lieu of direct confrontations. President Abdul Fattah al-Sisi expounded that terrorism is a multi-facet and complicated phenomenon, underlining the role of states and organizations that nurture and bankroll terrorism. He added: “We can never forgive those who spend billions of dollars in support of terrorism to kill our people and then speak about brotherhood and neighborhood”. Sisi added that terrorism will never be a pretext to suspend economic reform and development as well as efforts to realize sustainable development. “Terrorism, however, will be a catalyst for exerting more efforts at all levels” added the president of Egypt. President Abdul Fattah al-Sisi urged people to bear the burdens of comprehensive economic development to reap its fruits which is a modern state and a dignified life. For decades, the Egyptian economy failed to realize the optimal use of resources and economic crises piled up, but now the current generation has laid down strong foundations for a new modern Egypt whose people would enjoy prosperity and welfare. He said the economic reform program is well examined, noting that Egypt is opening the door for all serious investors of Egypt, Arab or foreign states, creating jobs for youths and upping state revenues to realize a quantum leap in all services offered to people, especially health and education. Sisi said he is sure that the Egyptians are aware of their high interests and they are adamant to proceed with economic reforms. He voiced appreciation for the Egyptian people who understand the requirements of the economic reform program.